� The gas mask is a mask used to protect the user from inhaling airborne pollutants and toxic gases. The mask forms a sealed cover over the nose and mouth, but may also cover the eyes and other vulnerable soft tissues of the face. Some gas masks are also respirators, though the word gas mask is often used to refer to military equipment (e.g. Field Protective Mask). The user of the gas mask is not protected from gas that the skin can absorb. Most gas mask filters will last around 24 hours in an NBC (nuclear biological chemical) situation. � Airborne toxic materials may be gaseous (for example the chlorine gas used in World War I) or particulate (such as many biological agents developed for weapons such as bacteria, viruses and toxins). Many gas masks include protection from both types. Gas masks are used in construction to protect against welding fumes, in deconstruction to protect against asbestos or other hazardous particles, and in the chemical industry when handling hazardous materials, as in making repairs to leaking equipment or cleaning up after spills; workers are usually issued gas masks as a precaution against leaks. � During riots where tear gas or CS-gas is employed by riot police, gas masks are commonly used by police and rioters alike. 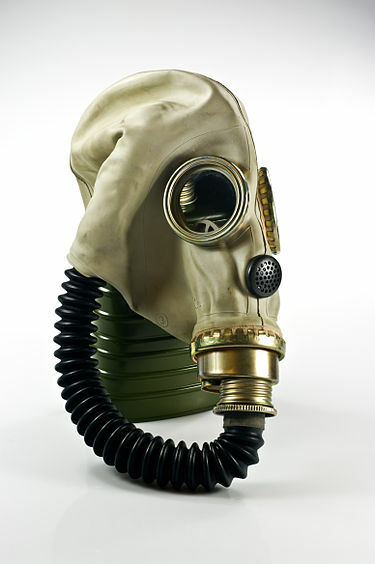 Aside from serving their functional purposes, gas masks are also used as emblems in industrial music, by graffiti taggers because the mask protects them from the graffiti canister's toxic fumes, and by urban explorers venturing into environments where hazardous materials, such as asbestos, may be present. � The traditional gas mask style with two small circular eye windows originated when the only suitable material for these eye windows was glass or acrylic; as glass is notoriously brittle, glass eye windows had to be kept small and thick. Later, discovery of polycarbonate allowed gas masks with a big full-face window. Some have one or two filters attached to the face piece; others have a large filter connected to the face piece by a hose.